VISALIA – Sometimes the hardest part of getting medical care, is getting there. But Kaweah Delta is cutting the rural divide between patient and provider by expanding services in existing rural clinics. Their latest unveiling was Saturday, Sept. 15 in Lindsay. The clinic is part of a three clinic expansion project that is bringing needed health services to people in rural areas such as Lindsay, Exeter, and Dinuba. The open house and health fair took place from 10 a.m. to 12:30 p.m. at Lindsay Health Clinic at 839 N. Sequoia. It included health information and $10 flu shots for the first 100 people in attendance, along with food, music, tours and more. “Our health clinics play an important role. They provide care in communities that would not otherwise have access to care and by keeping people well in their communities, the clinics help take pressure off our Emergency Department,” said Dave Garrett, Director of Kaweah Delta’s Rural Health Clinics, noting that about 40 percent of patients who come into Kaweah Delta’s Emergency Department do not have life-threatening illnesses or injuries. Dave Garrett, director of Kaweah Delta’s Rural Health Clinics announced “Happy Mexican Independence Day!” to those who came to the unveiling. The day was celebrated with dancers during after the ribbon cutting. Photo by Tom Kreger, special to the Sun-Gazette. • Doubled the size of the Lindsay Health Clinic and will this fall, bring much needed mental health services to the Lindsay area. 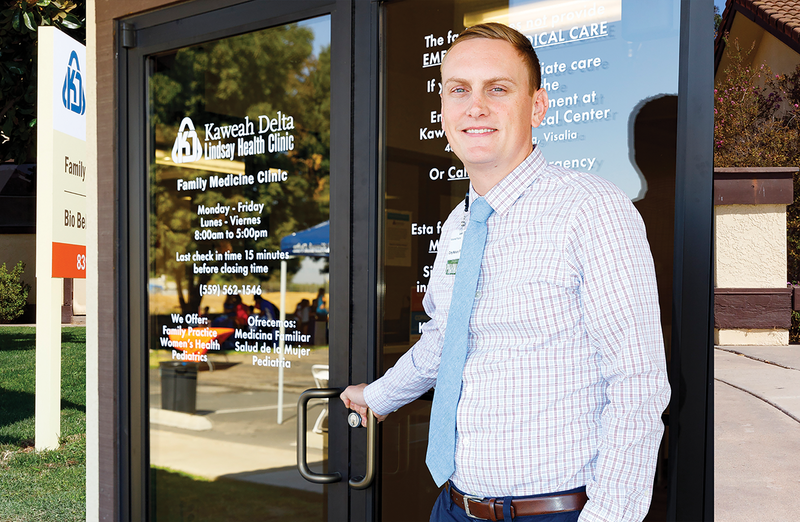 Patients will be seen by psychiatrists, including resident physicians from Kaweah Delta’s Psychiatry Residency Program. • Added a new Women’s Health Clinic with nine exam rooms and two procedure rooms to Exeter Health Clinic. The new Women’s Health Clinic has allowed the Exeter clinic to expand patient capacity for Family Medicine and specialty services such as Pulmonary Care, Nephrology, Neurology, Dermatology, Orthopedics and more. • Added five more exam rooms for women’s health services and a room to provide comprehensive perinatal services in the areas of nutrition, psychosocial and health education for women at Dinuba Health Clinic. Construction on the project began in 2017, and was completed in 2018; Kaweah Delta received approval from the state to open in August. With over 5,000 dedicated medical professionals and employees, Kaweah Delta is committed to meeting the community’s health needs through state-of-the-art medicine, high-quality preventive services and specialized health centers and clinics. For more information, visit www.kaweahdelta.org.